5:30am. I awoke from a great night of sleeping, sat down & loaded the pictures I took of my room yesterday, into the computer. I’m up now, slight headache, but the bed was very comfortable. Breakfast is being served buffet style for 1 hour before our departure time, which is 8:30am. 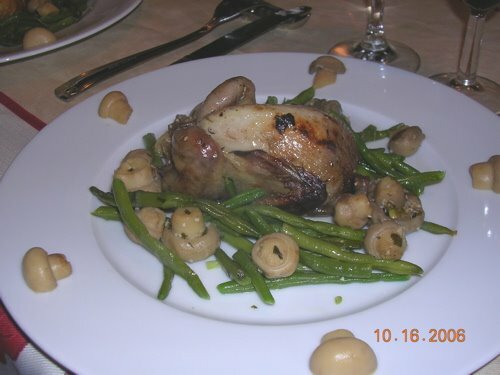 Dinner last night was mouthwatering; it was all appetizers that were delicious. We started with a champagne toast over little hour’dourves made individually of tomato, salmon, cheese, ham, and the lightest filo dough pastry. Then we sat at the table with wine (I had Orangina), there was a couscous dish, rolled prossutto with salami, salmon slices, a tomato, mozzarella, basil salad, the most mouthwatering grain bread that didn’t need any butter, and cantaloupe from the French Region of Provance that was as sweet as sugar. Then came out a dish of cheeses… oh my! 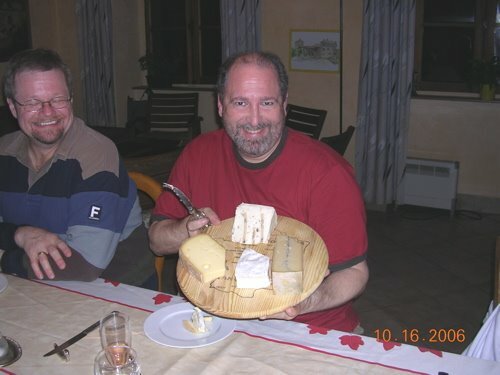 Blue cheese, Brie, and two others, what made them taste so good was that they are not pasteurized as in the states. I guess that takes away from the flavor. The brie (one of my favorites) was like silk. The Real Estate Agent from Tennessee had us in tears when he told us he sold a house to Dolly Parton and her partner Judy. He did mention that it is well known in her parts (no pun intended…OK yes I made a pun!) and respectfully accepted. 10:00pm What a fabulous day, starting with breakfast. Coffee in soup bowls, that’s how they do it here in France with streamed milk and fresh croissants… oh la la! Fruit, yogurt, oatmeal, bread butter. (I can eat breakfast like this every morning). It was very misty as we left the country house for The Chartreuse Region Nation Park. 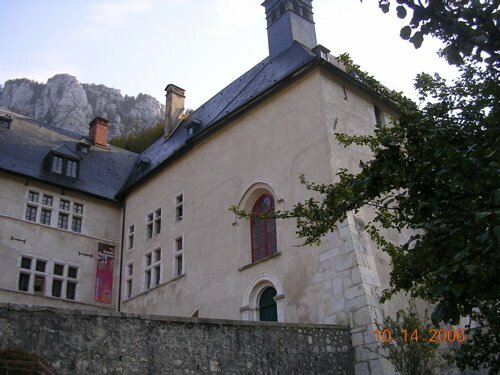 La Grande Chartreuse is the motherhouse of the Carthusian Order purposely built in an isolated area over 1000 years ago. These monks live in a vow of silence, we weren’t able to go in the actual monastery but the museum was humbling. It was about 55-60 degrees, and the weather was perfect. I did have to take a dose of Dramamine; the turns in the mountains were stomach turning. Les also had the same issue so we both sat up in front… that helped some. 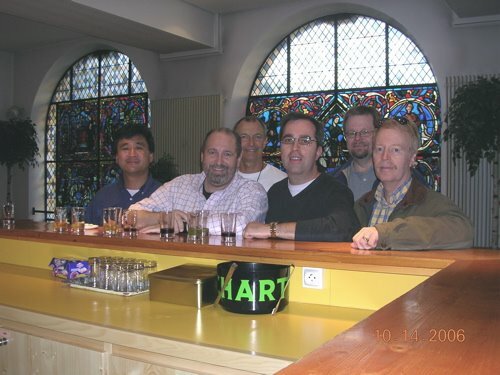 The history of the liquor Chartreuse, only 2 monks know the recipe and they travel separately to the distillery in Voiron in case something happens to either one. After the museum we went to Voiron for lunch in a charming bistro. I indulged in baby ravioli with shrimp cooked au gratin with le crème. Yum! I walked a bit around this quaint lovely town with Kelly & Les. I could easily live here. The French are so basic and straightforward, and yet relaxed in a way the Americans are not. Then we visited the Chartreuse cellar, the longest in the world (500 feet long) where the liquor is made out of 130 different herbs. We had a tasting after the tour. I wasn’t crazy about the green (55% alcohol), or the yellow (42%) but I did like the fruit one. This region is only 2 ½ hours away from Geneva Switzerland and 45 minutes from Grenoble where the 1968 Olympics were held. We returned to the house at 5:30pm and gathered at 6:30pm for our aperitif of Blackcurrant Chartreuse (Cassis) and white wine. Tasty! For dinner we sat down to a wonderful salad with walnuts, hard-boiled eggs, greens, baby tomatoes, apricots and a balsamic vingerette dressing. Blue Cheese, Brie, Gruyere, and something else. They were all good. And finally for dessert we have a stewed pear drizzled with chocolate and whipped crème and cherries.